Coach's Corner - Samuel Clemens/Mark Twain hand signed "Morales" certified vintage cut! Go Back to Lot List Samuel Clemens/Mark Twain hand signed "Morales" certified vintage cut! This vintage cut of white paper measures 3.25x6, and is in EX+ condition. 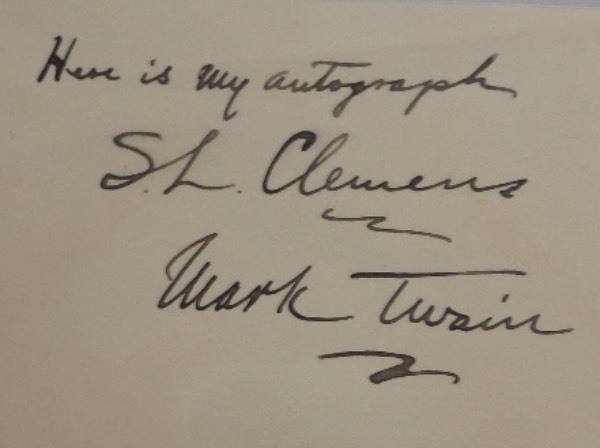 It is hand signed in black ink by 19th century author extraordinaire, Mark Twain, also reading his real name of Samuel Clemens, and including a Here is my autograph inscription and grades a still strong overall 6.5. Ideal for use as a bookplate with any of his numerous classics, and retail here is low thousands, easily! Especially when fully certified by court-qualified forensic science examiner, Chris Morales!